April 12, 2014: Here's another problem solvable by by our Brute Force program which applies exhaustive search matching possible values with variables in a set of equations. Brute Force Version 3.1 adds the absolute value function, "abs", to equation formats to enable solving the "Billiard Balls" problem. The problem is to arrange 10 billiard balls into a triangle meeting a set of rules about the balls numbered 1 through 10. One of the constraints is that the balls in a particular row all have numbers more than 1 away from their neighbors. This constraint for balls with numbers "a" and "b" can be expressed with the equation "abs(a-b)>1". 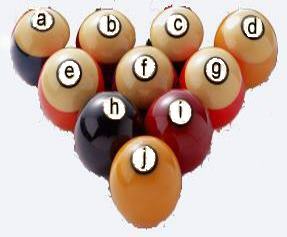 Sample problem BilliardBalls.prb is included with the download and is solved in about one second. April 28, 2014: It has been a productive month for getting spring duties accomplished but not so productive programming-wise. I spent more hours than care to admit on two programs. Oscilloscope Version 4.2.4 was posted today with some cleanup of the diagnostics when an input device fails to open for display. I'll post our Logic problem solver tomorrow along with a problem which the program cannot solve and a request for help.